Credit: Metro Transportation Library & Archive. Former Los Angeles County Supervisor and city of Los Angeles Councilman Ed Edelman passed away Monday at 85. 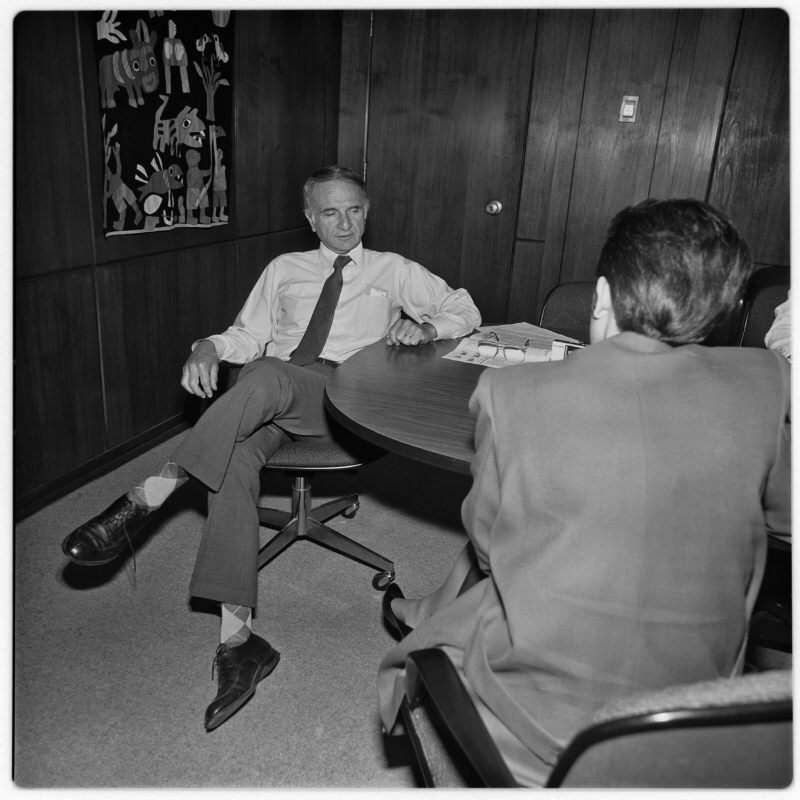 Besides being an extremely nice guy, Ed was of that first generation of local politicians who were able to get something done when it came to building a modern transit system. He was a Supervisor from 1974 to 1994, meaning he helped get the first two countywide sales tax increases (Prop A in 1980 and Prop C in 1990) approved by voters to start building the Metro Rail system. This came after years of geographic infighting among L.A. County politicians — the main reason that 27 years passed between the demise of the last of the streetcars in 1963 and the Blue Line opening in 1990. But lest you think my respect for Ed is all about these favors, my real admiration for him was actually inspired by what I saw in those documents. Time after time, the archival letters, articles, and memos revealed local politicians bickering and grandstanding about rail, so often just trying to serve their narrow interests and gain political support. Yet it was clear from the internal debates and votes cast that Ed was a quiet and staunch supporter for a system that wouldn’t benefit his constituents much in the near term but would serve the greater good in Los Angeles. His [Westside] district was not part of the densely populated core where the first lines would go. But he recognized the need to improve mobility across the region. He knew his constituents would benefit indirectly, even if there wasn’t a ribbon cutting in his district in the near future. I know that much of this is ancient history for readers here. But I’ll say this: if you think building a new rail line is hard today, it was almost certainly harder in days of yore. The Metro Rail system may not be perfect, but every line on the map represents a lot of hard fought victories and many chances to have taken the easy way out and stick with the status quo. On behalf of Metro, Rest in Peace and Thank You, Ed Edelman. The changing L.A. skyline! 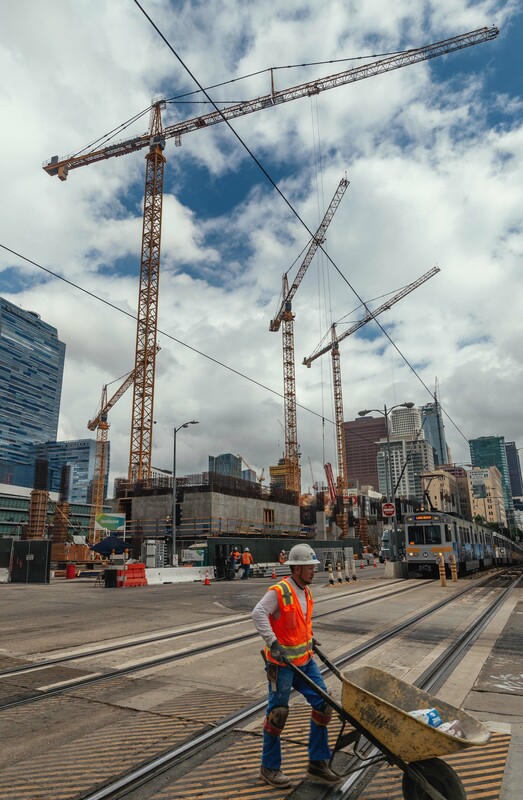 The Blue Line and new building construction near Staples Center and LA Live. Photo by Steve Hymon/Metro. Sure, the Rams looked awful. So what. The NFL season is a long one and teams — even good ones — get knocked out of their cleats all the time. Local fans with long memories may recall the ’81 Oakland Raiders who managed to get shut out three weeks in a row and still finish 7-9. Any Given Sunday, people. And because I know Jeff Fisher has nothing better to do than read the local transit agency blog*, I’d hold off playing Goff this season. Better for him to sit, learn and stay alive! A few things I heard at the annual APTA conference, which is in L.A. this week. •”Guess what, the mayor understands traffic signal prioritization….it starts at the top,” said the chief innovation officer for the Houston Metro during a panel on innovation. Well, okay. •”I often tell the story about growing up in the projects and I saw infrastructure being built and I saw no one who looked like me building that infrastructure,” said Metro CEO Phil Washington, who grew up on Chicago’s South Side. “I walked up to get a job and I was told you’re not trained and you’re too late.” Phil sees Metro’s role as rebuilding and building our county’s infrastructure and providing jobs and training that will also help rebuild our region’s middle class. •At the mega-projects panel discussion here Tuesday morning I did a headcount of the people immediately surrounding me and about 75 percent were dudes and 25 percent were not. The percentages are probably slightly more even among the entire crowd here. My point: transpo is changing but is still a lil’ too much of a dude’s world for my tastes. L.A. is seeking revenue purely through sales tax; Seattle's ST3 is a blend of hikes in sales tax, property tax and vehicle licensing fees. Good breakdown of the numbers. One thing to duct tape to your memory banks: The threshold for victory in Seattle is 50.1 percent. Here it’s 66.7 percent. That helps explains why the measure in Seattle is transit-only and ours is transit-highway — the one here needs to earn more broad-based support to pass. Actually, up to 350. But the firm that builds them, Proterra, says that kind of mileage is still enough to serve nearly most bus routes in the country before a recharge is necessary. Metro is working on getting an electric bus into regular service, btw. Hard to argue with any of this op-ed, which offers some alarming stats that show pedestrians and bike riders are often taking the brunt of the transpo-related carnage out there. The two 23-story towers on Wilshire Boulevard would replace a parking garage. The city of L.A. will have to approve the buildings, which are a short walk to two Purple Line stations: Normandie and Western. I mouth off about technology and why Ubers are just non-yellow taxis, cast doubt on self-driving buses and, in general, question why any invention that came after 1978 isn’t a waste of my time. Click here to immerse yourself. Sure, you can follow me on Twitter. I usually lose three followers per tweet. 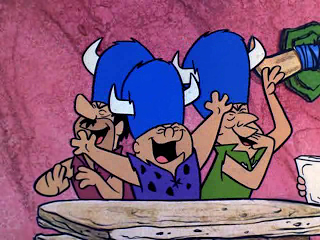 And if you don’t know what the Loyal Order of Water Buffalo are, then you need to spend some down time with the Flintstones. Everyone knows the Loyal Order has the absolute best panel discussions. *If you’re Jeff Fisher and reading this, I do have a play I’ve drawn up called ‘crowded train car right.’ Meet me on the Expo Line and I can draw it up for you! You need to completely redo the Blue Line Pico Station. It needs serious upgrade now with all the development there. That was a post for the ages. Good stuff, Steve. It definitely needs to be looked at. I think it might be easiest to just put an over or underpass for Pico traffic and leave the rail station as is on the ground. Obviously having the rail and station underground would be great, but that might be the difference between 30million and 300 million. Is there any plan to move the El Monte Metrolink Rail station from its present nearby location to the El Monte Busway? The tracks are adjacent to the Busway but the station is a couple miles away and not really easy to get from the train to the busway station. It would be a win-win for commuters in the inland empire. The Metro Board last October approved going forward with a feasibility study of possibly moving the station. https://metro.legistar.com/LegislationDetail.aspx?ID=2486702&GUID=F42114D4-E19E-4A66-922A-9C336E47FE64&FullText=1. I don’t believe it is finished yet, but I’ll definitely post when it’s released as I know this is of interest to a lot of folks in the area.